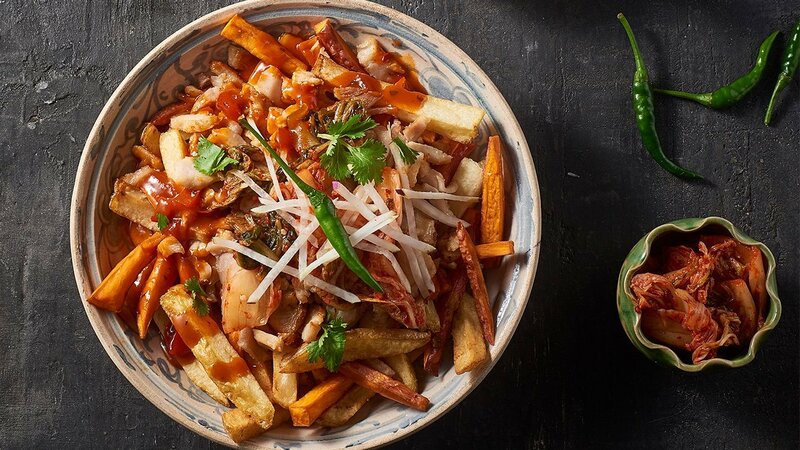 When it's time to turn up the heat - we load our hand cut fries with a Korean fermented ethnic food. It's a sure fire across all venues. Place cabbage in a large bowl. Sprinkle with salt. Pour over the water. Stir to combine. Set aside for 1 hour to 1 hour 30 minutes, turning cabbage occasionally, or until wilted. Transfer to a colander. Rinse under cold running water at least 3 times. Drain well. Place in a large clean bowl. Set aside. Mix KNORR Portuguese Peri Peri Sauce GF, KNORR Professional Ginger Puree and KNORR Professional Garlic Puree in a bowl, adding fish sauce, sugar and shallot. Pour the cabbage into the mix. Use your hands to quickly but thoroughly combine. Seal in a large sterilised glass jar, allowing a 3cm gap from top of jar. Set aside at room temperature for 2-3 days to ferment. Store in the fridge for up to 3 months. To make the fries, cut the potatoes into desired size and place in the fryer until golden brown and cooked through. Once cooked, drain and season with KNORR Aromat Seasoning. Divide into bowls and load with kimchi. Drizzle with KNORR Portuguese Peri Peri Sauce GF.